CashAdvanceInternet.com strives to protect consumers from unlawful lending behaviors by questionable payday lenders, while preparing consumers for making knowledgeable loan choices. The Dodd-Frank Wall Street Reform Act states that all lenders, including payday loan lenders, must engage in “fair lending,” and can be explained as “fair, equitable, and nondiscriminatory access to credit for consumers.” Dodd-Frank also gives the authority to the Consumer Financial Protection Bureau to implement fair lending regulations. If any complications regarding legality were to arise, customers are advised to file a grievance with the agency. CashAdvanceInternet.com’s guidelines strongly obey to the rules set by Fair Lending Laws, such as the Truth in Lending Act. Prior to lawfully accepting a loan, customers will be presented with the fees, rates, and charges specific to their loan. CashAdvanceInternet.com and the lenders we work with adhere to federal regulations; individual states have many different laws regarding payday lenders as well. They are as follows: firm observance of local laws concerning interest rates, rollover limits and fees, maximum loan terms, cool-off periods between loans, presentment limits, and other specifics. CashAdvanceInternet.com adheres to all requirements of the Fair Debt Collection Practices Act enforced by the Federal Trade Commission for customers repaying their loans. 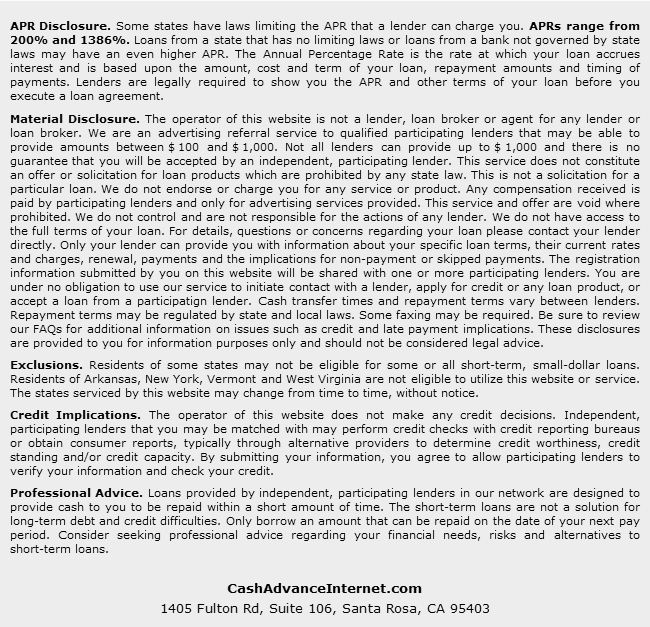 CashAdvanceInternet.com does not collect debts from consumers; we necessitate all lenders that we affiliate with to follow the below rules, despite the fact that CashAdvanceInternet.com is not an actual lender. If a lender were to violate these or other FDCPA statutes, CashAdvanceInternet.com will stop conduction business with them and they will be reported to the FTC. Every day our servers are updated, security checked and virus-scanned to ensure your information is secure. Firewall protection is monitored constantly to keep your information safe. We do everything technologically possible to ensure that your information remains your information. Do not send sensitive information to us via e-mail. Instead, use our contact form. Keep your browser up to date. Most web browsers send security updates on a regular basis. You should always install these updates as soon as they become available. Keep your anti-virus software up to date and make sure your computer firewall protection is always operating. When choosing a password, make it difficult to remember. Yes, for best security this is true. Make it a combination of number and letters, upper and lower case letters. This will increase your account security greatly. Of course, do not share your password with others. Do not use the same password for every site either. So, if your password is discovered, this will lessen the impact. Contact us immediately if you see any e-mails that look suspicious. We recommend that you check your credit score once a year to make sure the information is accurate and to make sure you have not been a victim of identity theft. Report any suspicious activity immediately to the operator of the website. It is also recommended to check your credit report yearly to make sure everything is accurate, and also to ensure you have not been the victim of identity theft.